At Lynxlets you will find a quality service provided from friendly helpful staff. 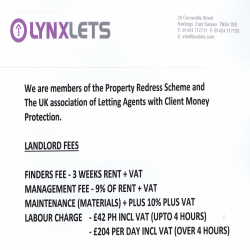 Maintaining a service to ensure we gain longer term tenants. Our motto 'our house, your home' is where we set our standards, making you feel like you are in your own home, and we provide a swift and effective maintenance team to keep on top of all repairs and maintenance requirements. As a landlord we maintain the require levels of Buildings Insurance, but it is your responsibility to have adequate Contents Insurance, as items inside your home are there at your own risk. Please try the Insurance link where a hassle free form could get you the required levels of cover for a very attractive premium. So if you are looking for a new home to Rent give Lynxlets a try and enjoy a harmonious relationship between landlord and tenant.